This entry was posted in Events, Faculty, Students and tagged Algernon Sydney Sullivan Award, President's Luncheon on April 19, 2013 by Wire Eagle. AUBURN UNIVERSITY – Two students and one faculty member were recognized with Auburn University’s highest honor for humanitarian service Tuesday, April 16, at the annual President’s Luncheon in the Student Center ballroom. 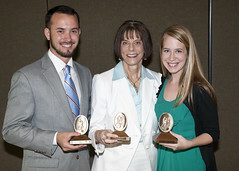 The Algernon Sydney Sullivan Award was presented to seniors Evan Lutomski and Emily Scammell, and Harriet Giles, director of external relations in the College of Human Sciences and managing director of the Auburn University Hunger Solutions Institute. The national honor has been presented at Auburn since 1951 as a reminder of the noblest human qualities exemplified by Algernon Sydney Sullivan, a prominent humanitarian and first president of the New York Southern Society, now the Algernon Sydney Sullivan Foundation. Each year, Auburn bestows the honor on one male and one female student from the graduating class and one non-student.